Although the colors on the USE Associated Gasoline Round sign appear to be red and black, they are in fact red and a dark navy blue. Surrounded by a navy blue boarder is the red background. At the center of the sign is an old gas can that is filled to the top. 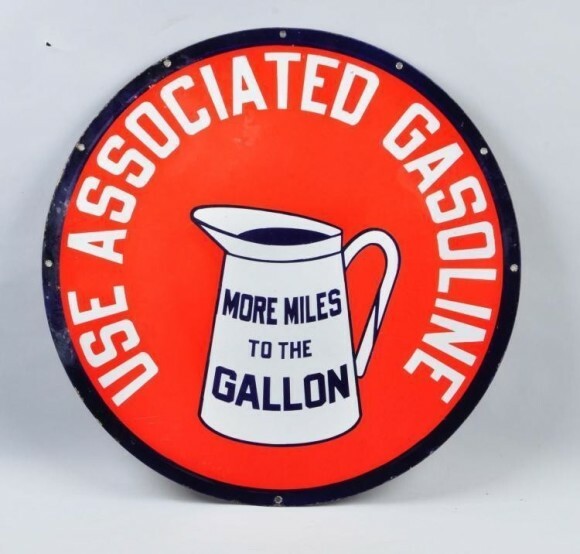 The text on the can reads “More Miles to the Gallon.” To the upper, outside is text that reads “USE Associated Gasoline.” The sign is round and measures 28″ in diameter.